This Week in Time Capsules: Are Time Capsules Still Cool? This week in our time capsule round-up we have a new time capsule vault in Massachusetts, an "evidence packet" submitted into capsule evidence in Iowa, and some Great Recession artifacts in Florida sure to bum out the good people of tomorrow. Also, a columnist in California worries that with the kids these days all hopped up on their Twitters and their Chatted Snaps, maybe time capsules just aren't cool anymore. But were they ever? Answer: no. Well, probably not. A columnist in Gustine, California is frustrated with people in his local community who aren't exactly flooding the local historical society with letters for their new time capsule. 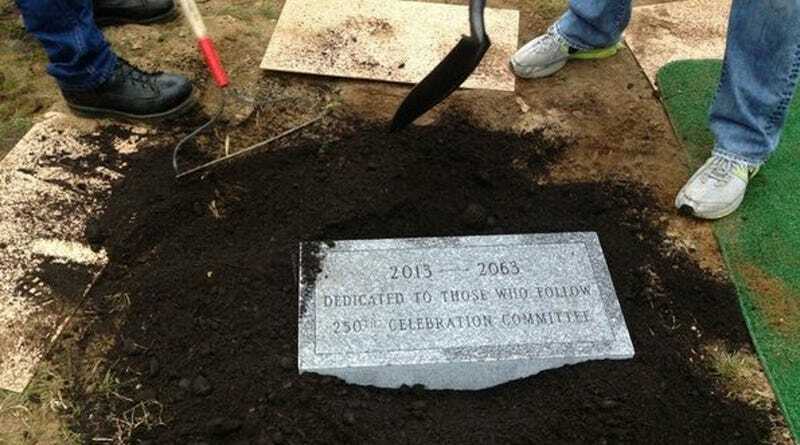 Historians are making plans to soon bury the time capsule for another 25 years… but so far the flood of letters and items to be included has been more like a trickle, if that. Maybe that's just a sign of the times we live in. Twenty-five years ago, putting something in the time capsule was still cool. Massachusetts Vault Will Carry Letters and Photos to 2063 A.D.
A time capsule was sealed in Manatee County this week as part of Florida's Viva Florida celebration. Set to be opened in 2055, it's designed to show the people of the future plenty of evidence of economic hardship inside. This Week in Time Capsules: Do You Even Lift? "We included a lot of stuff about finding jobs, finding social services," capsule organizer Pam Gibson told the Herald Tribune. "That's one of the sad realities we're living with right now."